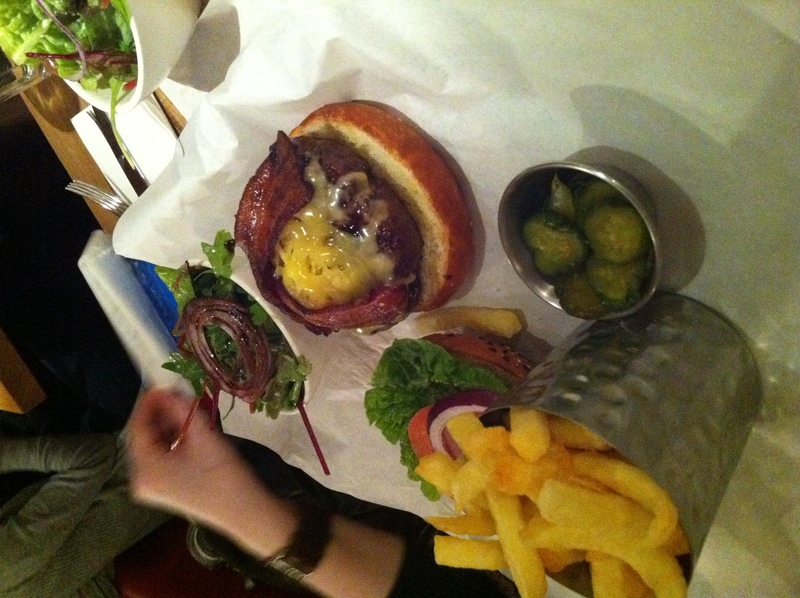 Last weekend I happened across an amazing eating hole in London. I was reading Grazia magazine (no judgement!) and I read about a new restaurant that had just opened up in Mayfair thats mission was to bring ‘reasonable’ priced lobsters and Champagne to all. As I happened to be staying in Mayfair that night, it sounded perfect. Especially seeing as earlier in the year Tim and I had been to Cape Cod in the USA for the weekend, and Tim had made it his mission to eat lobster for every single meal all weekend. Oh and I’m quite partial to Champagne. Tucked down a windy street, is the, blink and you’ll miss it, Burger and Lobster Restaurant Cocktail Bar at 29 Clarges street, Mayfair London W1J 7EF. There was a bit of a wait, but they are happy for you to go to a pub down the road and call you when your table is ready. The super friendly staff took us to the table and told us about the menu. All with Chips and a Salad and for £20 and thats all they do. Tim and I, of course, had all three. The atmosphere is relaxed and throughly enjoyable. Everyone enjoying tucking into their lobsters. Which by the way live in a giant live lobster tank below the restaurant. The food was excellent. The lobster roll was first and was amazing. Now I’ve had a few lobster rolls in my time, after being educated about them in New Brunswick, Canada, I have hunted them down in Atlantic North America ever since. This was definitely up there in the best that I’ve ever had. 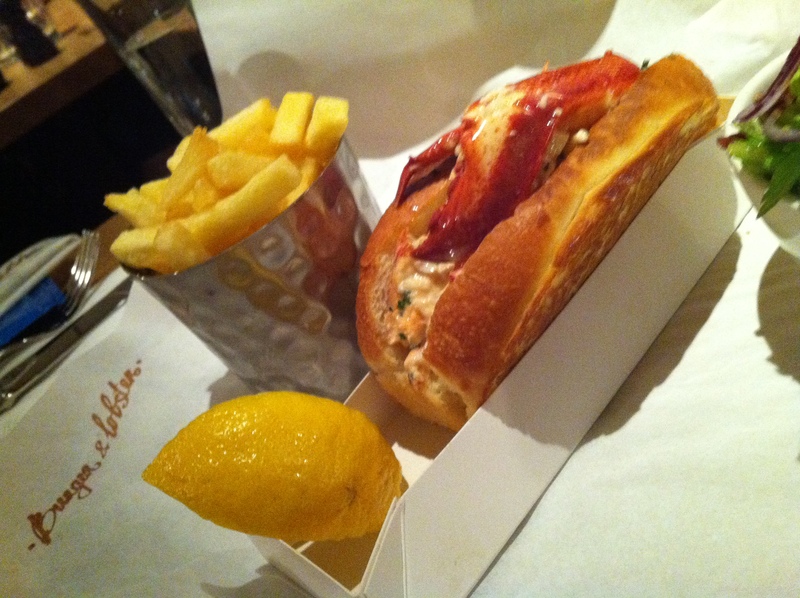 Perfect brioche bun, not too much but enough citrus mayonaise and a whole lobsters worth of meat in there. 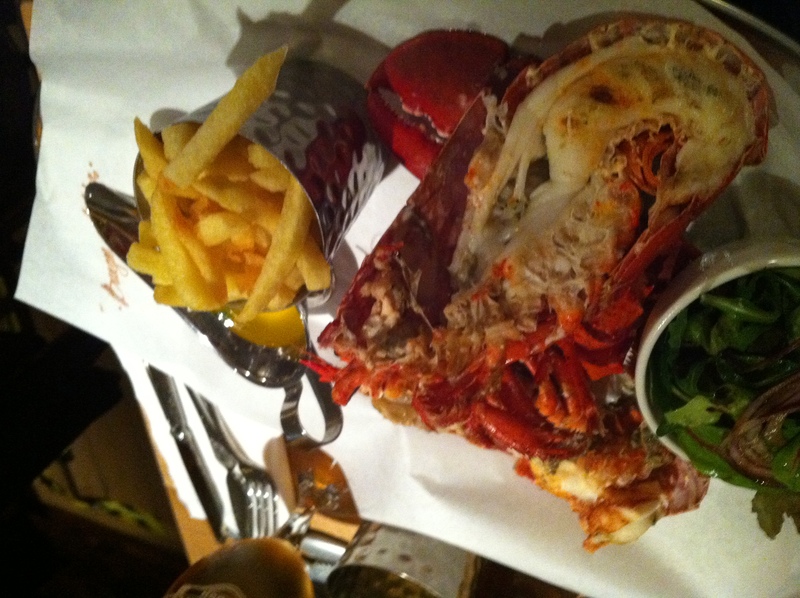 I then had the Burger and Tim the Lobster. You have a choice of boiled or grilled and with lemon garlic butter or just plain melted butter. Both were pretty darn yummy. All in all this was a great place to go and I will definitely be going back next time I’m in London.